One of the most beautiful maps of Rhode Island ever created was this one, drawn in 1777 by an English surveyor named Charles Blaskowitz. During the American Revolution, Rhode Island was close to the front lines, and mapmakers needed to understand the land for military reasons. But as beautiful as it is, the map does not come close to showing all of Rhode Island. Narragansett Bay is the defining feature of Rhode Island, the body of water at the heart of the state, near all of the different islands, pieces of shoreline, and inland areas that make up this unusually-shaped state. Without Narragansett Bay, Rhode Island would be quite a lot smaller than it is. Famously, it’s the smallest of the fifty states, but it’s also watery. Rhode Island is the third-most watery state – 33.1% of its territory is water, after only Hawaii (41.2%)and Michigan (41.5%). What little land we have is usually pretty close to Narragansett Bay. But it’s always changing – at high tide, our land area is even smaller! 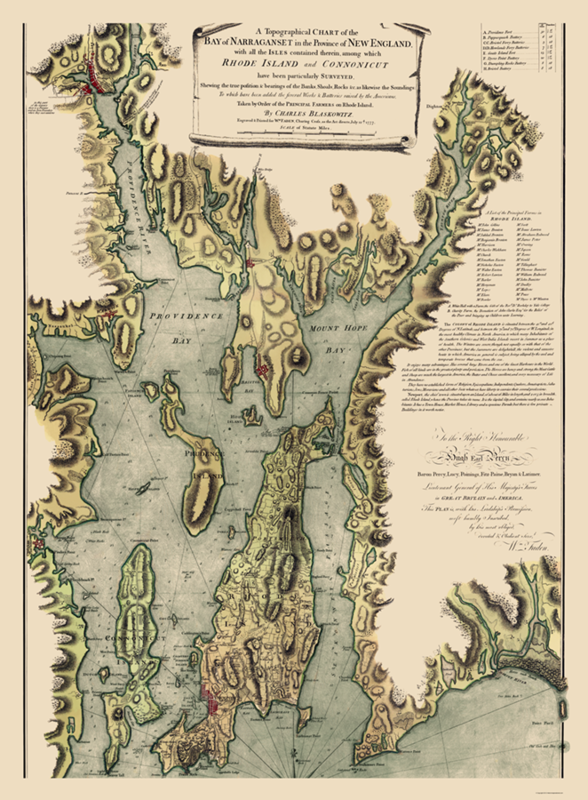 Read Ted Widmer's full essay on Narragansett Bay here » or watch historian, Chris Pastore, talk about how people thought about Narragansett Bay in the 17th century in the video below.